In Louisiana, the incidence of cancer and other debilitating, sometimes terminal illness, is among the highest in the United States. While our community aggressively battles this alarming reality, it must also reach out to the sick and dying to address their needs–including the provision of spiritual guidance and comfort for them and their families. God’s people need to have a place that will provide comfort and peace–a place that will continue to nurture families even after the journey of their loved one is complete. Sister Dulce Maria has prayed with and comforted the sick, terminally ill and their families. She has offered spiritual guidance to those who seek the Lord. She has been led to see the importance of having a place where God’s suffering people and their families could find spiritual consolation and guidance. To provide a haven where the sick and terminally ill can visit and be accompanied on their journey towards God. It will minister to the suffering and those who support them on their journey. To provide opportunities for those who seek a deeper understanding of their faith through prayer and counsel. 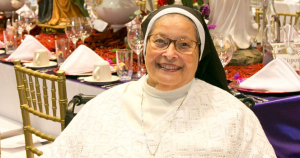 To provide housing for the Mercedarian Sisters of the Blessed Sacrament who will be available to support and provide spiritual guidance for all those who seek comfort. Many people suffer with terminal and debilitating illnesses. This ministry offers those people an opportunity to seek the Lord’s help during this struggle. Prayers are offered to eliminate the diseases and pain associated with these illnesses and Sister Dulce intercedes to Our Lord asking for His healing and mercy. Cypress Springs Mercedarian Prayer Center offers several opportunities for adults to further their spiritual lives. This includes Spirituality Classes for both men and women. Sister lectures and leads conversations on different topics that affect our everyday living (i.e. our roles as Christian adults); the importance of daily prayer; living as Disciples of Christ; and evangelizing just to name a few. Cypress Springs Mercedarian Prayer Center offers several opportunities for growing in our spiritual life. There are Women’s and Men’s Spirituality groups that meet every month, Rosary groups that meet every Tuesday, retreats, Bible studies as well as our annual events such as St. Joseph Altar, LaPosada, guest speaker series, Passion Walk, Dining by Design. See our event calendar for additional information on all events.